The star-power of the second term Congress Lok Sabha member from Thiruvananthapuram is undeniable. Dr Shashi Tharoor is the official spokesperson of the Congress party. A bundle of energy and a forceful and an eloquent speaker, he is constantly on the move - addressing conferences and fora within the country and across the globe. In May 2009, Shashi Tharoor was elected to Parliament, from the Thiruvananthapuram constituency in Kerala, and served as Minister of State for External Affairs in the UPA government, and also as Minister of State for Human Resource Development. He was re-elected for a second term in 2014. In a three-decade long career with the UN Dr Shashi Tharoor had held the office of Under-Secretary-General for Communications and Public Information during the tenure of Secretary-General Kofi Annan. He was the official candidate of India for the position of UN Secretary-General in 2006 and came a close second to Ban KI Moon. Multi-faceted, he is an award-winning author of fourteen books, a columnist, human rights activist, and a cricket enthusiast. 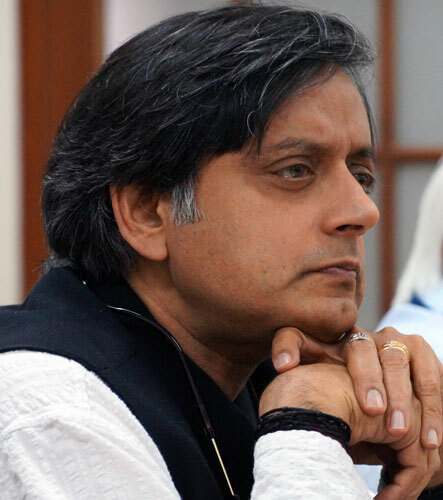 Born in London in 1956, Tharoor was educated in India and the United States, completing a Ph.D. in 1978 (at the age of 22) at the Fletcher School of Law and Diplomacy at Tufts University, where he also earned two Masters degrees. He is fluent in English, French, Malayalam, and Hindi. Did you anticipate Congress’ election results? No I did not. In fact I was quite open in my view that we would do worse than the last election; but I was expecting that worse would mean somewhere between 120 and 130 seats - and I had a reason for that calculation – I said that in five states i.e. Kerala, Maharashtra, Karnataka, Assam, and Punjab - we’d get about 60 seats and that in the rest of the country we would do so badly that all the other states put together would only get another 60 seats. I thought I was being very cautious and that we would in fact get a little more than that. That was really my view. There are others in my party who claim they were not as optimistic. But I have yet to meet one person who thought we’d get below 50. I met very few people who thought we’d get only double figures. Dropping below 100 was considered inconceivable, because our worst ever performance was 116. So, I must say that it was a shock and certainly these numbers have been very, very sobering. Congress defeat – was it due to leadership issues or credibility issues?